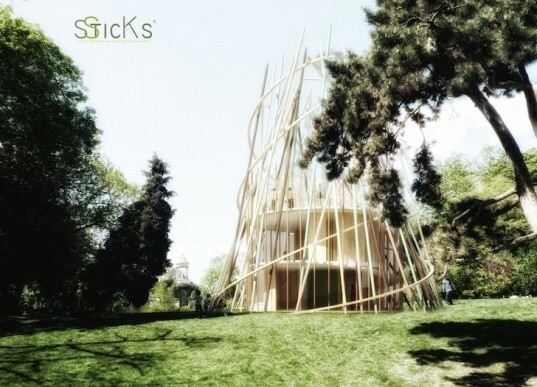 Nobody bypasses city planning restraints better than French designers Djuric Tardio, whose recent concept—titled "Sticks"—envisions the installation of tipi-shaped miniature kindergartens in urban parks throughout Paris. 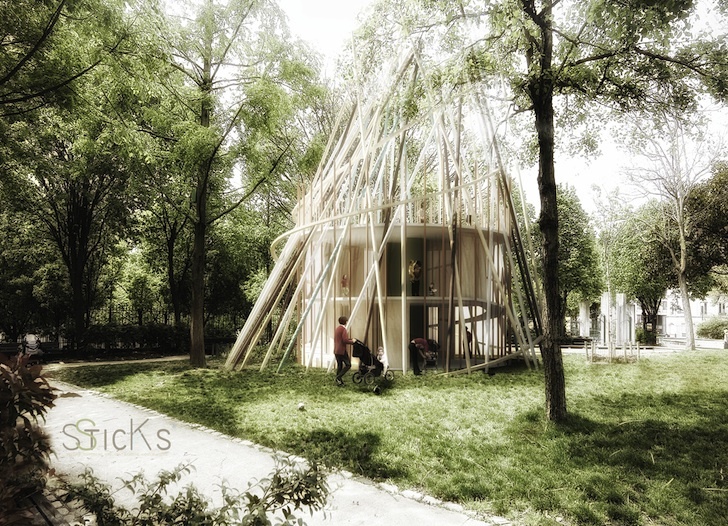 Responding to a lack of quality kindergartens in Paris as well as prohibitive permitting requirements, the studio proposed to build a series of stick-clad three-story conical structures ideal for up to twelve children. Each Stick “nursery,” as Djuric Tardio calls them, will feature the latest in sustainable bioclimatic technologies to ensure that they are energy efficient and infused with natural light. The lower level will contain a reception and kitchen area, the second floor will be used for teaching and activities, and there will be a breezy terrace area up top. The idea is that these wooden structures (containing zero harmful, toxic materials) can be rapidly mass-produced at low cost. The kindergartens will be active during the day when the rest of the city is not using the parks and they will require very little site intervention giving each one a very small footprint, especially when compared to larger facilities that take ages to build because of city planning laws. Plus, by placing these small structures in parks, children will be allowed to take their first learning steps in a fresh and natural environment. We’re big fans of Djuric Tardio. Take a look at their lovely eco-sustainable house in Paris for another example of their unique approach to urban design. Nobody bypasses planning laws quite like Djuric Tardio!